IBM MobileFirst for iOS Hospital MD links key administrative tasks to patient, team member and facility data in a central tool for hospital nurses. Your day starts with notifications at the top of your agenda and patient cards at the bottom. Tap to review each patient, scan diagnoses and read through alerts. Tap on Today’s Discharges to pull up a list of patients ready to go home, and note any barriers to discharge that you see. View completed tasks, delegate responsibilities and locate care team members by tapping on their contact name. Your device automatically pulls a Patient Card up when you enter a patient’s room. Current care plan tasks such as vital signs, medications and clinical measurements are on view for review and updating. 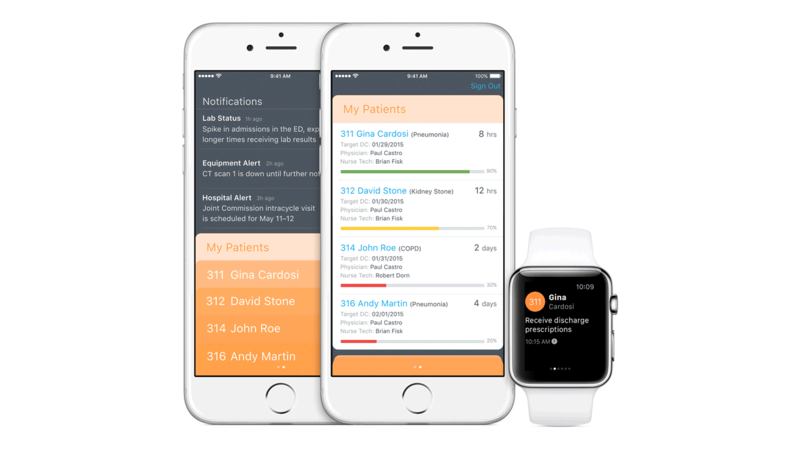 Apple iOS Beacon technology also tracks metrics like time spent in patient rooms for additional analysis. Key pieces of information on a Patient card includes care team contacts, notes, vital signs and discharge tasks. Drill down for further details, such as viewing a patient’s complete electronic health record (EHR), diagnostics, clinical status and medications. Historical data is also available to track changes for a specific measure. Tap to increase timeframes for longer views of patient progress, and use swipe left to view this same information for other measurements. Send and receive messages and notifications using your Apple Watch, iPhone or iPad. Tap messages to view anything from upcoming discharge tasks, newly scheduled appointments, recent vitals and other data. Send orders and complete discharge tasks from anywhere in the hospital, and text or call care team members without leaving the application.